The Meinel Building at the College of Optical Sciences has 18 conference rooms, meeting places and classrooms available for reservation. Refer to Room Inventory Log below for capacity in each room and photograph. The Conference Room Coordinator is provisioned to schedule ALL conference rooms with exception of room 547. Academic Programs, Dean's Office, or the Administrative Support Team are provisioned to schedule conference rooms: 447, 554, 647, 654, 747. We highly recommend the guest user brings a backup laptop and conducts a trial run prior to the event. The room must be left in condition presented. Recurring meetings can be scheduled from July to June of any given fiscal year. It is the responsibility of the person requesting the appointment or their administrative associate to update the recurring meeting in May (no earlier) for the upcoming year. There will be no “end of year” reminders to conference room users. If a person fails to schedule a recurring meeting and another meeting is scheduled at that time slot, the individuals who requested the reservation will work together to resolve the issue. If no resolution can be obtained, the person who scheduled the time slot first is assigned the conference room. 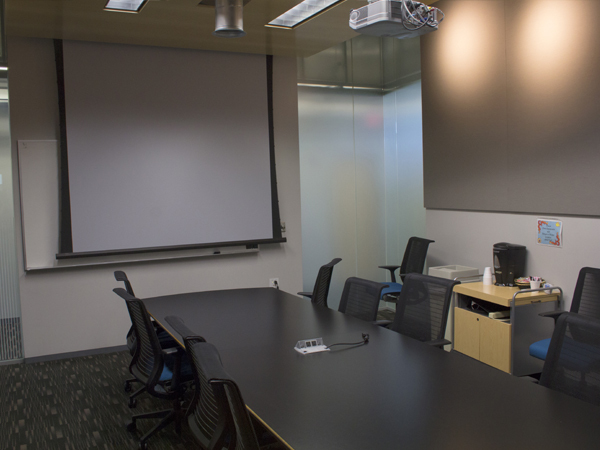 OSC conference rooms are reserved for faculty and administrative meetings. However, TAs and student study group can reserve a conference room no more than one week in advance of the anticipated meeting date. TA and student group reservations may be bumped at the discretion of the dean or a faculty member’s request for use. For questions and scheduling, please contact the Academic Programs office. Student study groups cannot schedule recurring meetings in the OSC conference rooms. Projector remotes are stored in each conference room. If a backup remote is required, please contact the coordinator or go to Room 702/704. Coffee supplies are provided by Dean’s Office for OSC patrons only, and only for administrative meetings of small groups of 14 or less. OSC Guest User is responsible for securing coffee supplies through Coordinator and responsible for making and clearing coffee & equipment. The coordinator will maintain conference rooms with dry erase markers and erasers.